Month by month and sip by sip. Sight: Hazy amber body with a dense beige head. Smell: Hmm…something seems out of place. Are those hops? While there are about a thousand different smells emerging from my glass, spruce and caramel are the dominant aromas. Flavor: Hmm…something seems out of place. Are those hops? As with the smell, there are a number of flavors swimming around in this glass. Unsurprisingly, hops take the helm of this flavor battle, with a exceedingly delicious herbal character. Other flavors (aka the losers) include Team Sweet Biscuit and Team Salty Caramel. Feel: This is one of those beers where the mouthfeel is so fantastic (read: appropriately carbonated) that you could drink a million regardless of its flavor. Luckily, the flavor also rules. So make that two million, please. 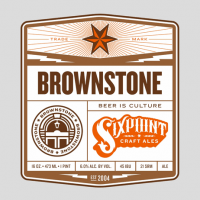 Concluding Remark: Sixpoint’s Brownstone is not as classic as its name would have you believe. (Brownstones? Vernacular architecture? New York? Anyone?) Instead, it is of the Indian Brown Ale variety with its immense hops content. I’m not shocked that Sixpoint’s Brown Ale favors the hops: they are known for producing big, hoppy ales. Brownstone is no exception. Perhaps I’m just over the sweet maltiness of the last month, but Brownstone is hitting the right spot right now. As I try to be as unbiased as possible (i.e., not let my own personal beer preference trump a stylistically accurate beer), I will say that as an Indian Brown Ale, Sixpoint’s Brownstone is a success. As a straightforward Brown Ale, it’s overly hopped. But if I’ve learned anything from a month of Brown Ales, it’s that it rarely pays to be straightforward. And by “pays” I of course mean that the straightforward Brown Ales were mostly pretty boring. Sight: Dark darky dark brown body with an inch of dense tan head. Smell: This is one deep brew: overpowering coffee, dark chocolate, and roasted malts. NOW TIME TO DRINK. Flavor: Impossibly delicious dark chocolate and espresso flavors. There’s also a rich, decadent caramel that swirls in the middle. A bite from the hops comes through at the end. Feel: Creamy, thin body with moderate carbonation. 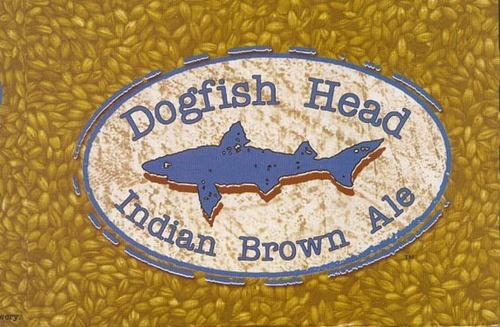 Concluding Remark: The Indian Brown Ale is one of Dogfish Head’s longest continually produced beers–13 years and counting. After enjoying a pint of it, this comes as no surprise. This is one of those beers that you pick up when just want something good. It’s sweet, dark, bright, hoppy…and quite alcoholic (7.2%). What more could one want in a beer? I was a little bit hazy on what constitutes an “Indian Brown Ale.” While I made the assumption that an Indian Brown Ale is a Brown Ale-IPA hybrid, the DFH website clarifies that it in fact a Scotch Ale-Brown Ale-IPA amalgam. Apparently, the Indian Brown Ale has to looks of a Brown Ale, the sweetness of a Scotch Ale, and the bitterness of an India Pale Ale. The result is the perfect offspring–eugenics at its best. Sight: Dark, muddy waters here. Tiny head that recedes quickly. Smell: Is this a Brown Ale? Initial waft is pine, mint, grapefruit, and rubbing alcohol if you sniff at it long enough. Flavor: The name “Monster” is definitely apropos. It tastes like all the flavors of a Brown Ale and all the flavors of an IPA. Isn’t there that term…what is it…”flavor country”? Well, I’m going to use that term and make a billboard that says, “Welcome to flavor country, population MONSTER.” But anyways. Flavors. Honestly, I’m having a difficult time discerning individual tastes in this big muddy mess. It tastes like being dropkicked by a ton of roasted malts and then punched in the mouth by a variety of hops. Clearly, those are this Monster’s fight tactics. Feel: Thinnish body with high carbonation. And it just feels DENSE. Concluding Remark: This is my first time trying anything from Big Muddy Brewing outta Murphysboro, Illinois, and what a way to start. This Monster Brown Ale is an intense Brown Ale-IPA hybrid, as stated in the “flavor” section of this programming. Perhaps it isn’t the most delicious beer of all time, but powerful as hell. Just as a Monster should be. While the flavors are a little MUDDIED (groan, pun), you’ll keep trying to figure out what you are drinking until it’s gone and all you’re left with is a faint memory of what once was. Kind of like a yeti spotting. So, on that note. 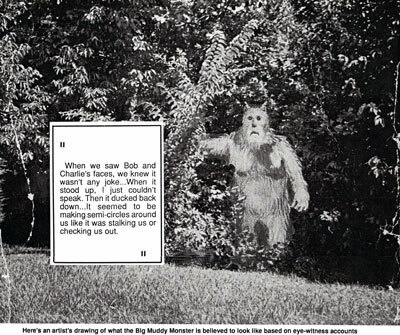 Naturally, I was wondering if the Big Muddy Monster was some legendary Illinois cryptoid, because that’s just who I am. And guess what?!?! IT IS! Could this beer get any better? What I’m saying is that this is one scary beer for beer style classicists. But for those adventurous types, go put on your drinking and cryptoid-hunting gear, and fetch yourself a Big Muddy Monster!